InnerAction Media, an award-winning marketing agency based in Morgantown, W.Va., is seeking a Content Developer to join our inbound marketing agency. Job Description: Will assist in the development of written and video content for clients as well as internal use. This content will include: blogs, news releases, feature articles, web copy, email campaigns, video news packages and other content development as needed. 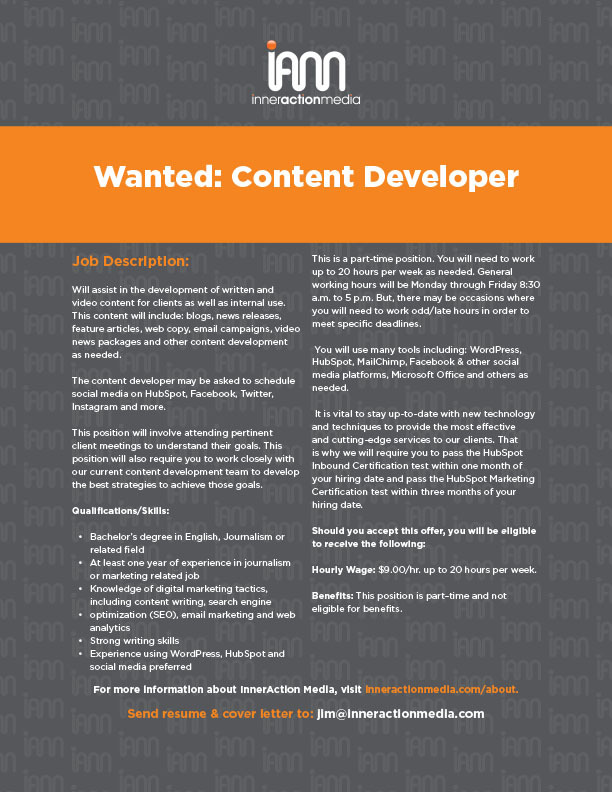 The content developer may be asked to schedule social media on HubSpot, Facebook, Twitter, Instagram and more. This position will involve attending pertinent client meetings to understand their goals. This position will also require you to work closely with our current content development team to develop the best strategies to achieve those goals. This is a part-time position. You will need to work up to 20 hours per week as needed. General working hours will be Monday through Friday 8:30 a.m. to 5 p.m. But, there may be occasions where you will need to work odd/late hours in order to meet specific deadlines. You will use many marketing tools, including WordPress, HubSpot, MailChimp, Facebook & other social media platforms, Microsoft Office and others as needed. It is vital to stay up-to-date with new technology and techniques to provide the most effective and cutting-edge services to our clients. That is why we will require you to pass the HubSpot Inbound Certification test within one month of your hiring date and pass the HubSpot Marketing Certification test within three months of your hiring date. Other HubSpot certifications that you may take include content marketing, email marketing, and social media certifications. Click here or the image to enlarge. Hourly Wage: $9.00/hr. up to 20 hours per week. Benefits: This position is part–time and not eligible for benefits. An employee's first 90 days of employment are on a probationary basis and are considered a continuation of the employment selection process. The 90-day probationary period provides InnerAction Media an opportunity to observe and evaluate the capacity of the employee, which includes the employee’s ability to satisfactorily perform the essential functions of his or her job and to observe and evaluate the employee’s work habits and conduct, including attendance and the employee’s relationship with coworkers and superiors. During this probationary period, InnerAction Media may terminate employment immediately, with or without cause and with or without notice. Likewise, the employee may also terminate his or her employment with InnerAction Media at anytime, with or without notice and with or without cause. InnerAction Media is an award-winning advertising and marketing agency with proven expertise in providing marketing communications to connect organizations with their target audience personas. We have experience in marketing hospitals, healthcare, attorneys, construction, higher education, tourism, banking, and real estate sectors. We are headquartered in Morgantown, West Virginia and serve the Pittsburgh, PA DMA as our primary market.